The Wildstar sisters do whatever it takes to get the job done. A squire’s father hires them to retrieve his son from a deadly contest. The Tournament of the Black Ring is a trial of the strongest warriors of the land, with the reward a guaranteed spot in the Twilight Brotherhood as a knight; all it requires are fights to the death, winner take all.The crowds cheer as the matches rage on; coin flowing as freely as blood. Now Alana, Karlyn and the squire find themselves locked in gladiatorial combat. The only chance at escape is to fight their way out.This is survival of the strongest. Alana spits blood on the dirt. She can't believe she allowed herself to be punched like that. She picks up her sword and gives chase towards the target. She sees Karlyn keeping up with him. He uses the forest to his advantage, running between trees and using uneven terrain to slow her down. At this direction, he's not going to where they want. She runs across a creek. The cold morning water seeps into her boots. Alana ignores it; plenty of time to get dry later. She cuts across the forest, following them with her peripheral vision. The morning light rises in their direction, forcing Alana to squint to locate them. They should have grabbed him in the night. Should have, could have. She can't think of the past, there's no time to give it. A boulder slab is in front of her; one of the markers. She slips the sword in her hand, lowering as much resistance as she can. She still has time to correct this mistake. Alana runs up the boulder and leaps off, rolling as she lands. Disoriented, Alana flips the sword and positions herself into a fighting stance. Their target falters and runs to her right. She gives a faux swing to keep his adrenaline running. A bolt shoots at their bounty, but he moves out of the way just before it reaches him. Alana turns to see Karlyn readying another shot. "Hurry and catch him," Karlyn yells out. "He's not going to get away." "I'll believe that when I see it." A crack of wood echoes out behind her. The trap triggered. Alana breathes out a sigh, at least she can stop running now. She sits on the ground. The forest hasn't stopped spinning yet. Karlyn extends a hand, helping Alana off the dirt. "How are you feeling?" "A little light-headed,” Alana responds. “I can go for a good breakfast when we get back to town." Picking up her sword, she sheathes it and goes to check on their prey. The bounty is hanging upside down, a rope fastened around his leg. The trap worked, not that she doubted Karlyn's craftsmanship. His untucked shirt is covering most of his face. Karlyn walks up to him. "We can wait until the blood rushes to his head and he passes out. That's an option." The bounty flails wildly hearing their voices. He pulls out a knife from his belt. Alana takes an extra step back for caution. "Oh look, he's trying to cut himself free." The bounty attempts to pull himself towards his feet, but can't quit manage it. Each time he curls, he falls right back down. No amount of stretching will cause him to reach the rope, let alone the time and effort it takes to cut through it. "I had to do it once," Alana says to him. "It's more demanding than it appears. I don't think you're the type who has the shape for it." She walks up and snatches the knife from his hand. "He's a big one to drag back." "It's a day's ride. Less if we keep a good pace,” Karlyn says. "He killed a guard. We'd have to keep an eye on him and make sure he's not up to something. Is there a price difference in how he's returned?" "Not even by a copper piece." Alana shrugs. "No reason to not keep the load light." Pulling her hatchet out, Karlyn grabs their bounty by his hair and brings the hatchet to his neck. Some of the coins have bloodstains smeared on them. Alana checks the side of her palm. Blood fell down her arm when handing the bounty over. She forgot to wash her hands since they returned. She gestures a nearby barmaid and asks her for a wet cloth. Karlyn finishes the pork on her plate, and gulps it down with her cup of ale. "Lately, the alive or dead bounties have been coming back dead. I'm wondering if we're being too aggressive in our dealings." "The last one shot at us with a bow and arrow, the one before that tried to trap us in a burning house, and the one before that actually wanted to eat us. So no, I don't think we're too aggressive. I think we're doing just fine. Real angry people in these lands, wouldn't you say?" "Same as every other place," Karlyn responds. "How's the bag feeling?" "With this reward, we should be fine for some time. Two weeks, if we're careful with what we spend on." Alana clicks her tongue. "We need to get more gold." "I'm not personally objecting to being paid in gold, but we deal with what we deal with. We went through our previous bounties quick. And you gambled most away of whatever we didn't go through." Alana exhales and strums her fingers on the table. The barmaid returns with the wet cloth, and Alana cleans her hands. "I'm typically good at cards. All I was trying to do was get some usable currency. Better than running after some criminal to get a little money. And besides, you saw their faces when they won our pile, they were so happy. Doesn't it just fill you with enjoyment we made someone's day?" "Copper, sure. Gold, no. That's our problem. Every place we encounter is a little bit different. Silver, copper, their value changes constantly. Gold, that seems to hold its value wherever we go. It's a universal language. If we were to have some gold on our hands, we wouldn't have to accept every job that comes our way." Alana says, "How's this, next job that offers gold pieces, I'll accept without question. Would that make you happy?" "Very. Get ourselves some decent lodging next time." Karlyn looks around the inn. "What are you talking about? This is a fine establishment. Good food, cheap beer, and the beds are not made of dirt and rock." Alana sees Karlyn brush the compliments away, and they return to enjoying their evening. A bard plays a cheery melodic tune that slowly turns somber. A story like many others, of doomed royal lovers who enter life with passion and end in regretful suicide. It's a sweet enough melody, but Alana can't say she empathizes with their struggle. She’s never been one for romance. Probably for the best. Given their predicament, it's a blessing they have no familiar faces to return to. It keeps them clear of any bounties or related family members who hold a grudge. She takes another drink of ale; clean and crisp. Another benefit of constant traveling. Alana folds her arms on the table and rests her head. She watches the crowd as the song comes to a close. The difference in those who love the song and clap, and others who clap out of habit. Her eyes feel heavy. The heat from the fireplace fills the room. As she drifts off, a man walks up to their table. Alana picks up her head and scans him quickly. Nice robes, finely made. Proper posture and his voice comes from his upper chest, causing her to move back from him slightly. He's nobility, through and through. "That would be us. What do you want?" "I require your services to retrieve my son, a squire. He's entered a tournament and his life is in danger." Alana lazily looks to Karlyn, who wants no part of this conversation. Exhaling deeply, she moves her plate from her view and motions the man towards her. "Sit down." The man sits across from them. "Thank you for listening to me. I heard from the marshal that you two caught a fleeing criminal faster than he's ever seen. Said he saw you leave after accepting the contract, and before he knew it you returned." "I can't say that's the fastest we ever apprehended a criminal, but I can see why he said that." Alana grabs her mug and takes a sip. "Sir, I'm letting you know our services have been altered since our contract with the marshal of this town. To hire my sister and I, you'll need gold." She blinks. "I'm sorry, what did you say?" "I can pay in gold. How much will it take?" Alana notices the conversation has grabbed Karlyn's attention. She mentally takes account. They did recently arrive here, which means they have a week or more before having to leave from the transition. Their coin purse has enough for five days, but it's copper, which leaves them to chance if the next place they visit considers copper valuable or not. Gold can take them a long way. Alana smiles to the man. "Don't worry about the number. Tell me about your son." They order more food. The bar maid brings pork and bread, but Rowley Callaham refuses to take a bite. He drinks the pale ale they order, although he doesn't seem to take much satisfaction from it. "It's called the Tournament of the Black Ring. The Twilight Brotherhood runs the event. They are one of the kingdom's most dominant military forces, and not just by reputation alone. 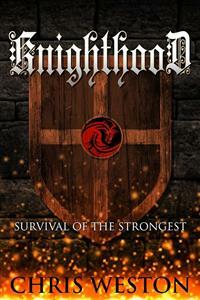 Once a year the tournament is held, and whoever survives is granted knighthood into their ranks." Alana asks, "And your son is going to enter in hopes to become a knight?" "Yes. Aaric left and there was nothing I could do to stop him." He exhales. Alana sees he his slouched over the table. She and her sister are probably not the first people he's attempted to hire for the job. It seems like a case of a father not wanting to see his son drift away. She clears her throat. "If Aaric is a squire, what's the reason he's taking this challenge in the first place? Surely the knight he works under will commence a dubbing if he's proved himself." Karlyn interjects, "Being a squire isn't a half-bad role in and of itself." Callaham takes another drink. "It was that damn Sir Marsen and his drunken ramblings. He's in no rush to knight my boy; and he's young, he wants to prove himself. I was that age once, and that desire never truly leaves you. He thinks he knows everything about the world, but I don't want anything to happen to him before he realizes how big the world really is."